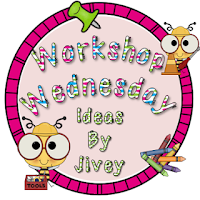 Today, I'm linking up for my first Workshop Wednesday with Ideas by Jivey! I've been working on this post for quite while and it fits perfectly with this linky party! Thanks Jivey! Since it's the month of July, the focus of this linky is on how you prepare for Workshops. Our school has been slowly transitioning all the grade levels into reading and writing workshops. As a fifth grade teacher, we were one of the last grades to be transitioned. It's been an amazing three years and the workshop model has completely transformed my way of thinking and preparing! You can preview the Reading Workshop and Writing Workshop online books at Heinemann Publishing. *It appears they are no longer in publication but I found them for FREE on Plymouth Public Schools Literary Connection. Click here. Lucy paired it down for these online grade level versions and gave teachers just the "teaching points" without all the theory. Thank you Lucy! These are great! She has created an entire year of lessons and plans for grades K-8! They are only $10 online for the digital copies! They are worth every single penny! Plus, there are no "repeats" from previous years! Luckily, our school calendar aligns almost perfectly to Lucy's books - so I can dig in right away and get started with my workshops (after the first 15-20 days of setting it up). After consulting "Lucy", I start hitting up the primary sources & trade books that can help supplement or enrich a lesson. Our historical fiction unit was new this year so I had lots of reading to do about the Civil Rights movement! Luckily, I was working with a fantastic group of teachers and curriculum leaders - we were all able to find such great resources! From there I start creating my own simplified plans that use Lucy's books as a reference. This past year, I was really trying to integrate reading and writing workshop into social studies as much as possible. Here is an example unit plan for Reading Workshop & Civil Rights. This was not just my plan... My fantastic teacher partner and collaboration group all had a hand in writing up this great unit! We also created an aligned Writing Workshop unit plan that had students writing historical fiction about the Civil Rights movement! Then, another fantastic colleague of mine drafted a letter to be sent home to parents, explaining the purpose of unit. If you want my version of the letter with level book club books you can download it here. My teaching partner and I worked really hard this year to create letters for each reading workshop unit. We wanted parents to know what we would be studying, what students would be reading, and the big "teaching points" of each unit. After all this prep.... read Lucy Calkins, find books, find more books, find fiction & nonfiction books, read novels, create a unit outline, write a letter to parents.... the fun can begin! Here are some "Social Studies" stations my classes worked on after all our history / nonfiction reading front-loading during workshop. Students were also able to "tweet" about famous quotes and their overall impression of the Civil Rights movement. Wish I would have taken a picture of my second class - they really #hashtagged it up and had some fantastic insights and reflections! This was a great spring board for discussing our book club novels later in the unit! That's my Reading & Writing Workshops in a nutshell. Do you have a plan you like to follow or a go to reference for lesson ideas? LOVE IT! You are speaking right to my heart. I love integrating science and social studies as much as possible! Thank you for sharing about those books! I'm going to snag up the 4th grade digital ones. How awesome! Thank you for linking up! I love how you integrated your social studies and the stations you shared are fantastic. Thanks for the link to the Lucy Calkins guides. I went to download those books as soon as I finished your post, but I can't find them! It keeps telling me that Heinemann doesn't carry them anymore :( Looks like an awesome resource though! OH, you make me miss teaching U.S. History!!! I LOVED teaching that along with ELA, and integrating the two. Now I'm kinda "stuck" in second, but have a new program this year with the "stuck in the cracks" kind of kids, so maybe we'll like being stuck together! You have great ideas, and I love it that you incorporate so many primary sources. You'd be surprised how many teachers don't know what those are! Thanks for sharing the link to those books. I just downloaded the 4th grade set for me.